Publisher: Hodder and Stoughton, 1938. First edition. Condition: Hardcover, no dust jacket. 16 beautiful photographs on individual plates. Name plate on fly page. Light foxing, text unaffected. A wonderful travelogue about the author’s trip to the Himalayan region. 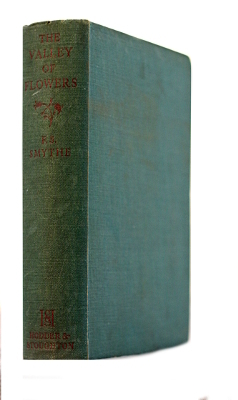 Incidentally, the term “Valley of Flowers” is now the official name of the region Smythe describes in this book. Originally called the Bhiundhar Valley (after a village located in south-east Badrinath) it was renamed “The Valley of Flowers” by Frank Smythe. Along with Eric Shipton and R.L.Holdsworth, he discovered it by chance during the expedition to the Kamet Peak. He returned to the Garhwal region in 1937 and spent three months making a number of first ascents in a rapid and frugal style, very modern in concept. He was profoundly affected by the profusion of flowers in the valley which was punctuated by waterfalls and trails crossing the lush alpine meadows – hence the very apt christening. The valley’s beauty has withstood the test of time and continues to attract many visitors. In fact, so high is the degree of visitation to the area that for preservation purposes camping is no longer allowed in the Valley. However, treks back and forth to the Valley are allowed. Frank Smythe played a central role in the Everest attempts of 1933, 1936 and, later, in 1938. On Everest, in 1933, he reached 28,100ft without using supplementary oxygen, his strong bid stopped by poor snow conditions and the lack of a partner. He was the climber who came closest to success prior to Hillary and Tensing and their peers (all using supplementary oxygen) and it was not until Messner’s 1982 solo ascent that his performance, in physiological terms, was bettered. Smythe joins Shipton and Tilman as one of the trio of great mountain writers of the period – Shipton the vivid geographical commentator, Tilman the wry anecdotal observer and Smythe the master of taut action and, helped by his fine photography, a profound observer of mountain moods. Frank Smythe thus became the most celebrated and popular mountain writer – photographer of his day – authoring 27 books.